September 3, 2018 — Links International Journal of Socialist Renewal — Turkey was thrust into a full-blown currency crisis when United States President Donald Trump hoisted tariffs on Turkey’s steel and aluminium exports to the US — the country’s most serious crisis since President Recep Tayyip Erdogan’s Justice and Development Party (AKP) came to power 16 years ago. The Turkish lira lost more than 40% of its value in the first two weeks of August, albeit its most recent humble recovery. The pretext for Trump’s punishing attack on Turkey, the seventeenth largest economy in the world, is the continued detention of the evangelical US Presbyterian missionary Andrew Brunson who was arrested in October 2016 on charges of espionage and accused of involvement in the attempted coup of July that same year. At first sight, the US-Turkey standoff appears to be a uniquely Turkish problem triggered by a very public confrontation between two leading members of the “ring of autocrats” of the 21st century and worsened by the idiosyncratic and often misguided economic approach of both leaders. This is not the case. One cannot look at the Trump-Erdogan conflict in isolation from the global situation. July 12, 2018 — Links International Journal of Socialist Renewal reposted from Socialist Project — The elections on 24 June in Turkey for a new president and parliament, which took place under a state of emergency, constitute an historic moment in Turkish republican history with important consequences. May 9, 2018 — Links International Journal of Socialist Renewal reposted from Tasmanian Times — On March 18, Turkish troops supported by a 10,000-strong horde of Islamist militiamen stormed into the city of Afrîn in northern Syria. After an unequal eight-week struggle against the Middle East’s most powerful military force, the city’s lightly armed Kurdish defenders had little choice but to melt away and fight another day. The city’s fall was inevitable. Afrîn is isolated from Kobanê and Jazira, the other predominantly Kurdish cantons to the east, and the Kurds had gambled unsuccessfully on international support against the illegal invasion. This was not unreasonable. 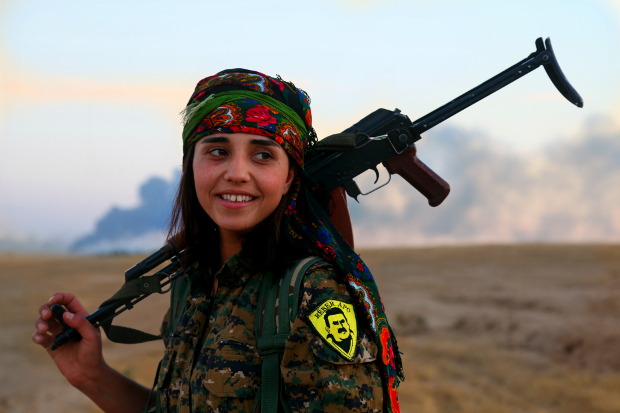 The invasion was patently illegal, and the world also owes the Syrian Kurds a debt of gratitude for their sacrifices in ridding it of the cancer of ISIS. Sadly, almost all of the world’s governments turned a blind eye to the aggression. Some of them directly or indirectly aided the Turkish aggressor. 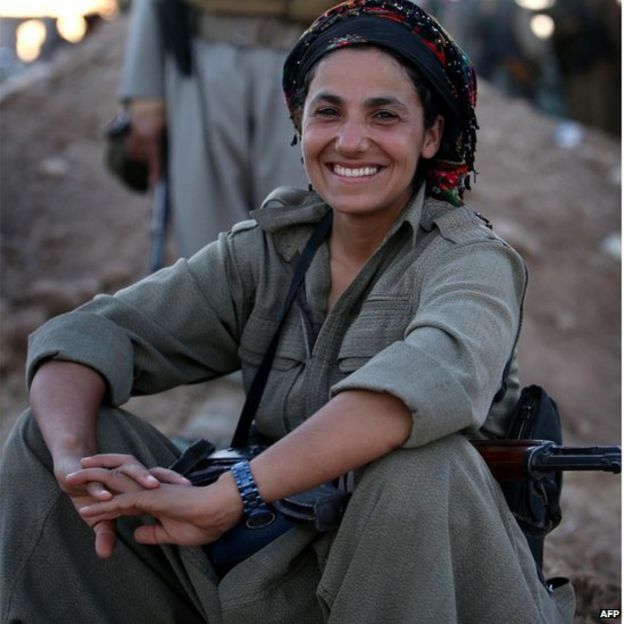 April 3, 2018 — Links International Journal of Socialist Renewal — When Meredith Tax saw pictures of gun-toting Kurdish women defending the northern Syrian town of Kobane against Daesh (so-called "Islamic State") in 2014, she was inspired to find out more. This book is the eventual outcome of her research. 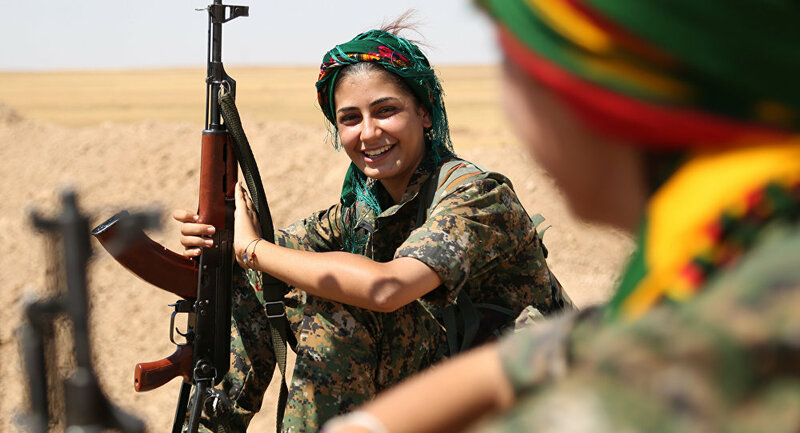 The female fighters of the YPJ (Women's Protection Units) are part of a movement aimed at radical change in Syria and the broader Middle East. Tax explores the history of this movement in the context of the history of the Kurdish people. February 8, 2018 — Links International Journal of Socialist Renewal reposted from The Region — Amedspor football club was little known outside of Turkey and the Kurdish diaspora until its captain and star player Deniz Naki was shot at on a German autobahn in January 2018. February 2, 2018 — Links International Journal of Socialist Renewal reposted from The Region — In an article I wrote a day before the Turkish state's invasion of Afrin, I intended to scrutinize the underlying ideological structures of the Turkish ruling party (AKP) and the driving force behind the invasion of Afrin. This article will focus more on the role of major powers, mainly US and Russia, in the recent invasion of Afrin and the stances held by the Assad regime and Iran. January 26, 2018 — Links International Journal of Socialist Renewal reposted from The Region — The dark clouds of 21st-century fascism are once again hanging over the heads of the people of northern Syria. As if the inhabitants of the region often referred to as Rojava haven’t suffered enough over the course of the past 7 years of war, the Turkish state has come to the conclusion that the time is ripe to pick up the fallen, bloodied sword from the corpse that is Islamic State. Together with Salafist mercenaries carrying flags of the Syrian ‘rebels’ – one of the many components of what at one historical juncture seemingly all so long ago was a cohesive ‘Free Syrian Army’ – Erdogan’s regime vows a ‘swift operation’ to destroy ‘terrorism’ in Afrin. It is Afrin that has been a beacon of stability in Syria over the course of the war, not only taking in tens of thousands of refugees from elsewhere in the country, but establishing the principles of direct democracy, women’s liberation and ecology in the midst of an otherwise catastrophic and tumultuous period. It is precisely this model of a socialistic, multi-ethnic, feminist canton advocated by the Democratic Union Party (PYD) that Erdogan’s AKP government sees as ‘terrorism’. The irony could not be more obvious. Turkey immediately announced its support for Qatar and accelerated legislation to send more troops to its military base in that country. It also called on Saudi Arabia to end this crisis. The Iranian government announced that its air space and land borders were open to Qatar in order to prevent a blockade against it. Subsequently, on June 11, the Iranian navy sent two battleships to the coast of Oman. ABSTRACT: Many in Turkey, including its political leaders, don’t accept there is racism in Turkey. They will say they are proud of their traditional hospitality and generosity towards foreigners. Similarly, academic accounts also generally assume Turkish nationalism is neither ethnic nor cultural nationalism, but rather an inclusive civic nationalism. 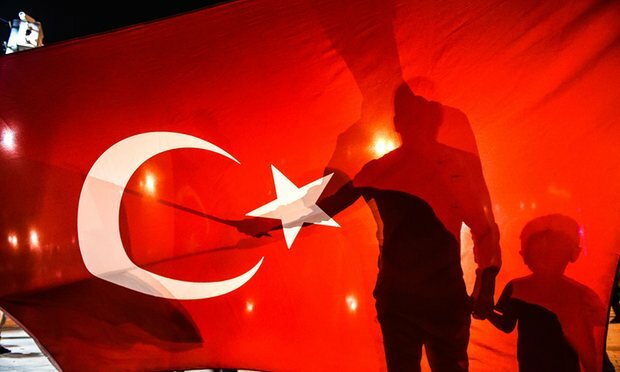 We directly challenge this conviction by arguing there is a dark side of Turkish nationalism, based on clear evidence there is an ethnic and racial discourse that shaped Turkish nationalism from the early years of the republic, and that this discourse plays a significant role in defining modern 21st Century Turkish nationalism. Thus, this modern Turkish nationalism includes, rather than excludes, an ethnic and racially defined narrative, which is a central tenet in defining modern Turkish identity. March 31, 2017 – Links International Journal of Socialist Renewal reposted from LeftEast – For the last several months in Turkish politics, the party-state’s agenda has been dominated by two interconnected operations: consolidation of power and elimination of opposition. March 28, 2017 – Links International Journal of Socialist Renewal – Sharply different opinions have developed among the radical left in recent years towards the Syrian radical democratic movement led by the Democratic Union Party (PYD) — an initially Kurdish-based force which through a series of political and military struggles and alliances has recently formed the Democratic Federation of Northern Syria, as a model for a multi-ethnic, non-sectarian, federal and socially just alternative for the nation and the region. Some on the international left have accused this movement of human rights abuses, political repression and collaboration with the Syrian dictatorship of Bashar al-Assad. I was prompted to write the present notes in response to two articles by Roy Gutman in the US Nation magazine (here and here). But as these articles both sum up and are fairly extreme examples of the left criticisms of the PYD-led movement, it makes sense to discuss some background and previous articles before taking up Gutman. George Souvlis: By way of introduction, could you explain what personal experiences strongly influenced you, politically and academically? Dilar Dirik: As a Kurd, you can never run from your identity, because your identity is essentially political and the level of your political consciousness acts as a self-defense as the only way to secure your survival and existence. That is why insistence on the free expression of your self-determined identity is portrayed as political controversy, nationalism, or terrorism by the capitalist-statist system. US policy in Syria: Confused or just confusing? February 27, 2017 — Links International Journal of Socialist Renewal — Since the Syrian civil war began in 2011, the US has been involved, at first, through arming and supporting groups opposing the dictatorship of Bashar Assad, and supporting allies in the region doing likewise; and since 2014, through its direct involvement in leading an international coalition in an air war against ISIS. Small numbers of US Special Forces and CIA operatives are also in Syria, supporting different, mutually antagonistic groups in the multi-sided conflict. The US role in Syria often appears confused and contradictory. This seems set to increase under the new US administration. Peoples' Democratic Party (HDP) MPs that have been arrested. November 10, 2016 — Links International Journal of Socialist Renewal — This brief presents an overview of the illegality of the entire political and judicial process leading up to the arrest of our Co-Chairs Mr Selahattin Demirtaş and Mr Figen Yüksekdağ, along with eight other MPs of our party on 4 and 7 November 2016. In response to domestic and international outcry over the arrests, the Erdoğan-AKP government officials have presented this a necessary judicial measure against our Members of the Parliament (MPs) who refused to follow the summons of prosecutors for interrogation in relation to criminal cases filed against them. In his statement to the press on November 4th following the detention of our twelve MPs the night before, Minister of Justice Bekir Bozdağ argued that our MPS had defied the rule of law by this refusal, and left judicial authorities with no other choice than bringing them before the court by force. November 4, 2016 — Links International Journal of Socialist Renewal reposted from Open Democracy — Ayla Akat, lawyer, former Peace and Democracy Party (BDP) MP for Batman, KJA Spokesperson and prominent Kurdish women’s rights activists based in Diyarbakir (Amed) was arrested a few days ago alongside other Kurdish women’s rights activists. They were protesting against the illegal arrest of Gültan Kışanak, co-mayor of Diyarbakir, who has been detained together with the city’s male co-mayor, Fırat Anlı. In addition, 27 elected Kurdish co-mayors are in prison in Turkey, while 43 of them were dismissed. On 11 September 2016, the central government appointed deputy governors as trustees to replace the dismissed Kurdish mayors who were elected by more than 70% of the public vote. Robert Leonard Rope(RLR): Please briefly describe your background. Were you named after Saladin the Great? And what was it like to teach at a university in Turkey? Saladdin Ahmed (SA): I never know how to answer questions about my background mainly because my identity has always been shaped around negations rather than the promotion of a certain upbringing. I wouldn’t say I have an identity crisis, but I would say identity, at least in today’s world, is itself a crisis. 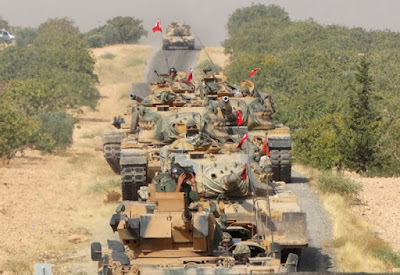 August 29, 2016 — Links International Journal of Socialist Renewal reposted from Crisis and Revolt — Turkey’s incursion into northern Syria on 24 August was flagged up as a move to drive the so-called Islamic State (ISIS) out of the border town of Jarabulus. But that is just a cover: Turkey’s not very secret major objective is to crush the 50,000-strong Kurdish YPG (people’s Protection Unit) militia, and overrun the three autonomous Kurdish dominated areas, collectively called ‘Rojava’ by the Kurds. August 27, 2016 — Links International Journal of Socialist Renewal reposted from International Viewpoint — In the wake of the failed military coup in Turkey, and the massive wave of state repression that has followed, building solidarity with the progressive resistance in Turkey and Kurdistan is even more vital. The attention of socialists and democrats worldwide will be turned towards the reactionary mobilisation that the ruling AKP has unleashed. This will put the HDP (Peoples Democratic Party) and the PKK (Kurdistan Workers Party) centre stage. The article below is taken from Coup and counter-coup in Turkey and Kurdistan, edited by Sarah Parker and Phil Hearse and published by Left Unity. It is a supplement to Dictatorship and Resistance in Turkey and Kurdistan by Parker and Hearse, which can be downloaded here. 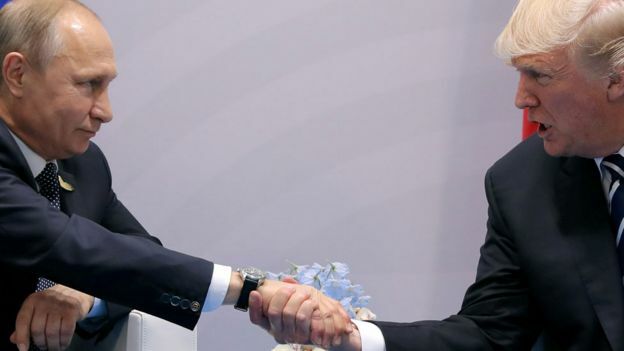 August 12, 2016 — Links International Journal of Socialist Renewal — The dramatic events of 15/16 July created an international shock wave: this was, contrary to some initial opinions, a very serious coup involving large sections of the armed forces. 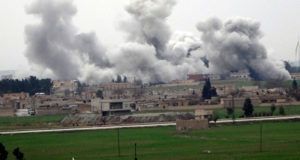 Both the parliament and the presidential palace were attacked by fighter planes. Hundreds were killed, both demonstrators and police killed by pro-coup soldiers and helicopter gunships, and young conscripts lynched by the anti-coup crowds. 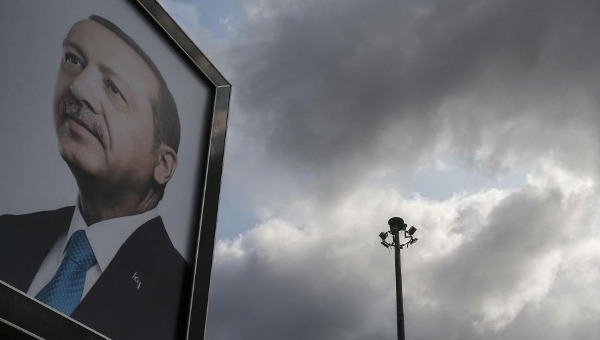 The coup showed the deep rifts that exist inside the Turkish ruling class, and its aftermath showed the growing drive towards the creation of an Islamist dictatorship.